Bondmaster LCD Repair | Welcome to A.P.E. BondMaster with Universal Bonding Fixture-high thermal mass heater with “Super Flat” floating alignment design ensuring repeatable accuracy for consistent bonding. 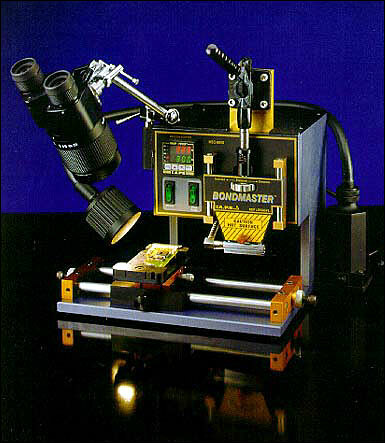 An economic and proven bonding system for Pager and Portable Radio Liquid Crystal Displays, PCMCIA, Heat Seal Connectors and Hot Bar Reflow Soldering. The BondMaster’s optimum Hot Bar Temperature Controller offers accurate and reliable temperature time cycle control. This is accomplished by a thermocouple sensor that is located directly within the Bonding Bar. The close-loop operation is calibrated to given operating characteristics and continually compensates for “Set-Point” of temperature drop and over shoot. This eliminates thermal stress, delimitation and heat degradation, providing a major advantage in the reliability of the bonded components.